The cardiovascular system is very sensitive to thyroid hormone and patients with hyperthyroidism may experience symptoms including palpitations and changes in blood pressure. 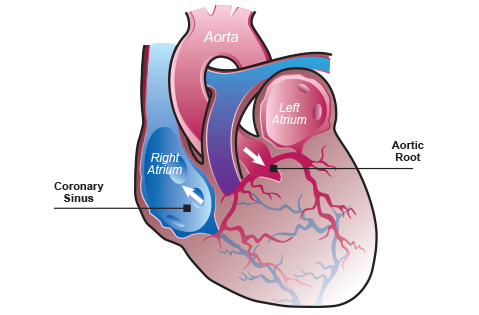 The human heart contains an enzyme that activates circulating thyroid hormone, called D2, but this enzyme is not present in adult rodent hearts. Is this an advantage or disadvantage for humans? Does this explain why patients with hyperthyroidism are susceptible to the irregular heart rhythm called atrial fibrillation? To understand the role played by D2 in the heart two independent groups of investigators created genetically engineered mice that express D2 specifically in the heart and therefore have intracardiac “hyperthyroidism.” In both cases the cardiac level of T3 (the active thyroid hormone) increased by about 25% without changes in circulating levels of thyroid hormones. Notably, in both mice the heart rate was stable, not accelerated, indicating the presence of compensatory mechanisms to control hemodynamic stability in the mice. Cardiac contractile function was notably increased in both of these mouse models (Pachucki et al, Endocrinology, 2001; Trivieri et al, PNAS, 2006; Hong et al, Endocrinology, 2013). These mice were then subjected to procedures to induce cardiac damage so that the response to injury could be assessed. Remarkably, when both new strains underwent different procedures to injure their myocardium, i.e. banding of the aorta to increase arterial pressures or administration of a cardiotoxic substance called doxorubicin, both types of mice with the hyperthyroid heart performed better compared to normal mice, with less deterioration of cardiac function and/or longer survival. These findings have very important repercussions because it would support the use of thyroid hormone in certain patients with a heart condition. In fact, clinical findings in humans do indicate that short-term thyroid hormone treatment to patients with cardiomyopathy significantly improved ventricular performance (Danzi & Klein, Med Clin North Am, 2012). This is particularly relevant because other animal models of cardiac injury indicate that myocardial hypothyroidism seems to be the default condition following myocardial ischemia or a myocardial infarct. This is achieved through the ectopic cardiac expression of the thyroid hormone inactivating deiodinase, known as D3. Thus, the fact that the two animal models with a hyperthyroid heart do better than controls suggest that the ectopic D3 expression during cardiac injury is maladaptive. To address this paradox, a third mouse strain with cardiac D3 disruption was studied but the findings were not so clear cut. These animals are born with a structurally “normal” myocardium but during adulthood exhibit scarring which restricts cardiac contractility. During the studies, further cardiac injury resulted in greater mortality when compared to control animals, not surprisingly given the already established cardiac impairment at the beginning of the experiment. More studies are needed but the evidence from two independent genetically engineered animal models indicates that a hyperthyroid heart (not systemic hyperthyroidism) provides a significant improvement in cardiac contractile function and protect against cardiac injury.